Electronic designs require a variety of stimulus signals during test. PicoScope comes with a function generator that can deliver standard waveforms such as sine, square, triangle etc. Many models also include an arbitrary waveform generator (AWG) that supports a wide range of application needs. You can program the arbitrary waveform generator from a text file or using the built-in AWG editor. The number of samples in the created waveform is limited only by the hardware of your chosen oscilloscope, allowing you to define complex waveforms. As PicoScope can export CSV and TXT files, you can even capture a waveform using your oscilloscope, modify it (if needed) using the AWG editor, and then play it back using the AWG. The function generator provides output of sine, square, triangle, ramp, pulse, sin(x)/x, Gaussian, half sine, noise, PRBS and DC waveforms* to your device under test. Sweep mode generates a frequency that varies between two specified limits. * Waveform types vary by model. PicoScope 5444B illustrated. Sweep mode generates a frequency that varies between two specified limits. In trigger mode the AWG waveform fires when PicoScope is triggered. The AWG can simulate complex signals and can be used to stress-test the robustness of a design with addition of noise, overshoot, spikes, dropouts and glitches that the design might encounter. 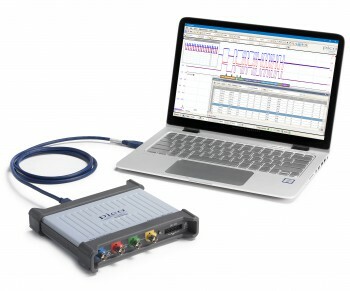 Allows you to copy captured data from a PicoScope channel into the AWG memory. You can also copy data from a math channel, so you can create an arbitrary waveform from an equation. Allows you to import a CSV format waveform file into the AWG memory from a PC. Once you have created your waveform with the AWG editor you can save it for later use with PicoScope.